Marina Ginestà i Coloma (29 January 1919, Toulouse, France – 6 January 2014, Paris, France) was a French-born Spanish veteran of the Spanish Civil War, who was a member of the Unified Socialist Youth. 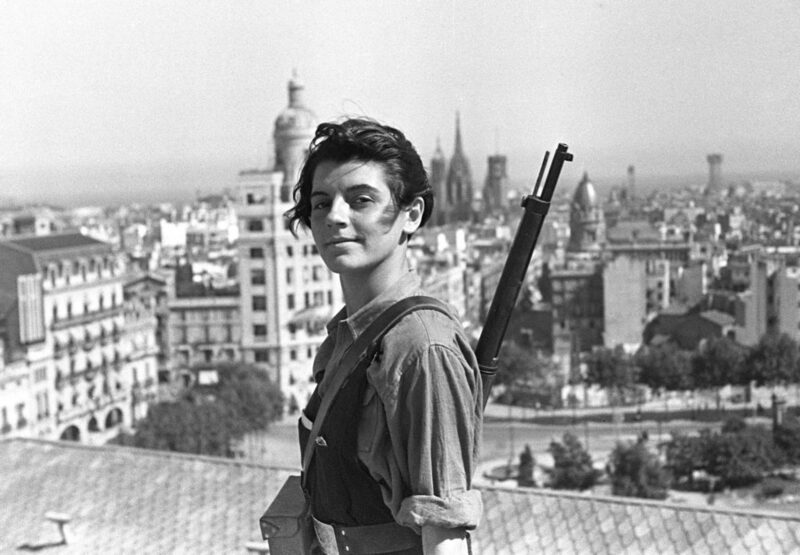 She became famous due to the photo taken by Juan Guzmán on the rooftop of Hotel Colón, Barcelona during the July 1936 military uprising in Barcelona. It is one of the most iconic photographs of the Spanish Civil War. The famous photograph was taken on 21 July 1936. It shows the 17-year-old girl posing with a rifle on the top of Hotel Colón. As she was a reporter, it was the only time Ginestà was carrying a gun. The picture was later seen in the cover of the book Las Trece Rosas by Carlos Fonseca. The hotel was destroyed after the war and on its place is today the building of the Banco Español de Credito.